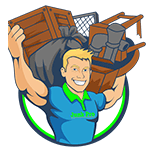 JunkPro was founded in 2007 by Jereme Willner to fill the need for junk removal service in the Tri-State area of southeastern Indiana, western Kentucky, and norther-middle Tennessee. Working closely with real estate professionals, JunkPro understands the needs of homeowners and business owners when it comes to the strategic disposition of residential & commercial junk removal. JunkPro satisfies those needs by providing a fast, convenient, and professional way to remove junk from your property. JunkPro is a full service REO Property Preservation Company. We at JunkPro care about the impact that junk can have on our environment. We also like to keep our communities and neighborhoods attractive. We strive to keep as much junk out of landfills as we can, so we make every effort to recycle or donate everything we can. We sort junk as we go, determining what can be recycled and what will be of value to our friends at The Salvation Army and St. Vincent de Paul. We separate the good from the junk, conserving metals, pulling wiring, and reclaiming other valuable recyclables. We remove hazardous materials and dispose of them properly. We are proud that our service is valuable beyond its convenience because of the significant reduction in landfill waste from recycling and reusing junk.